Quallet HVAC, Inc. provides a complete range of HVAC services for residential and commercial properties in Montgomery, Philadelphia, and Delaware counties. If you don't see what you are looking for here, contact us. 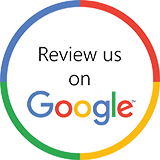 We will be happy to answer any of your installation and service questions! 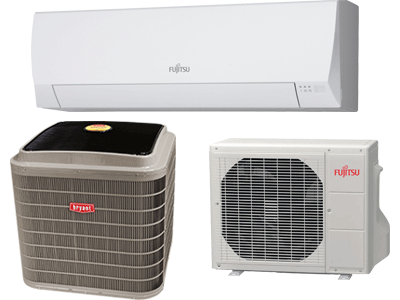 A typical household air conditioner consists of an outdoor unit (the coil, condenser and evaporator) and an indoor unit (the air exchanger, which connects into your existing duct work). New systems are pushing the bounderies of quiet operation (as low as 68 dB) and high efficiency (as high as 20 SEER and 14.5 EER). If you're using extremely inefficient window units, or you have an older air conditioning system that's not keeping your cool, it's time to call Quallet HVAC to let our skilled technicians evaluate your current HVAC equipment and cooling needs. An alternative to your typical central air conditioning system is a ductless or mini-split system. These units have one or more smaller outdoor units connected to wall mounted units inside your home. With a mini-split system, you put the cooling (and heating!) in the rooms that you use it most. Why pay to constantly cool and heat empty rooms in your home? A mini-split system can save you hundreds, or even thousands on your electric bill with efficiency ratings (27 SEER and up!) that your typical central air conditioning system can't even come close to! Joe and his son came out to assess the situation after I was abandoned by another so called HVAC professional. Quallet HVAC was professional, timely, fairly priced and the installation was done exactly as they described. I am thrilled with my Fujistu minisplit and would recommend Quallet to anyone. THANK YOU!!! The thermostat(s) in your home tell your heater or air conditioner when to turn on and off, based on the desired temperature that you set. Older, dial type thermostats let you set on temperature, and if you left it set while you went to work... you just paid to heat or cool your house all day. 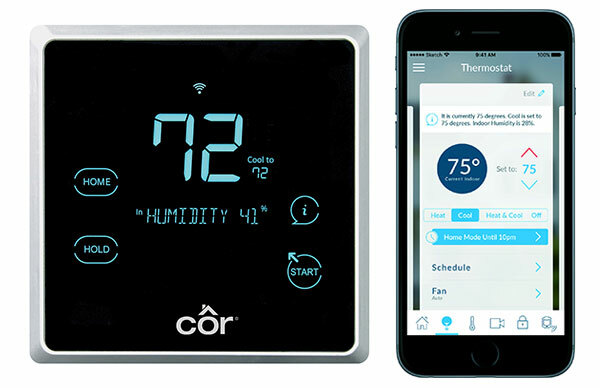 Modern electronic thermostats can save you money because they allow you to set multiple times for heating and cooling to be on or off each day, depending on the day of the week. This way you can "set it and forget it" and not pay for heating and cooling when you're not at home. In a traditional forced hot air, or hot water radiator heating system, the furnace or boiler is what provides the heat. In a furnace, natural gas is burned and the resulting warm air is passed through the heat exchanger which warms the air that is then blown thorough your ducts and into your home. Cold air is brought into the furnace via your return vents. With a hot water radiator system, gas or oil is burned to heat water, which is then pumped through radiators in your home to provide warmth. Heated water can also be pumped through radiant floor heating, which is installed under the flooring in your home. Traditionally a tank style water heater has an insulated tank of 40 or 50 gallons that is kept hot by a gas or electric heat source. When you turn on a hot water faucet, water from this reservoir is sent to that faucet and mixed with cold for the desired temperature. Lifespan on a typical tank water heater is 8-10 years. Failure of a hot water heater can be gradual, or catastrophic (imagine you're away and your tank goes, dumping 50 gallons of water in your basement - and the refill line that tries to keep your tank full runs until you realize you have a foot of water in the house! Within the last few years, tank less style water heaters have started to catch on. Instead of paying to keep a supply of water heated all of the time, a tank less water heater heats water "on-the-fly". When you open a hot water faucet, the unit is triggered and a heating element kicks on to instantly heat water passing through the unit on it's way to your faucet. Joe and his team were excellent from beginning to end! Joe was very knowledgeable in diagnosing the issue we were having with our condenser and laid out our options clearly (we decided to replace our condenser). During installation, his team was courteous and tidy, and it was clear that they took pride in their work. I would gladly recommend Quallet HVAC to my friends.